Visage Salon offers a wide assortment of hair care products and accessories in addition to its featured Bumble and Bumble shampoos, conditioners, etc. We have a beautiful assortment of hats and scarves, carefully selected hair care products from other manufacturers that compliment our B&b line, as well as the tools you need to manage your hair when away from the salon including high quality combs and brushes. Visage offers hair care products from Surface including Surface: Awaken Therapeutic, a sulfur and paraben free product for fine and thinning hair. Visage offers products formulated by Dr. Murad a certified dermatologist, for fine and thinning hair whether natural or color treated. Visage offers Onesta all natural, clean and eco-friendly hair care products. These products are among the top players in the in the Italian fashion industry. Visage focus on their sulfate and paraben free Milkshake line. These products available at the salon are designed to fill out fine and thinning hair. Ask any of our stylists for further information. Visage offers a line of professional quality brushes and other hair care accessories and tools from BioIonic. Cricket is a manufacturer and supplier of hair care tools for salons and their customers. Visage carries a wide assortment of Cricket combs, brushes, etc. Selection and fitting by appointment to ensure privacy. 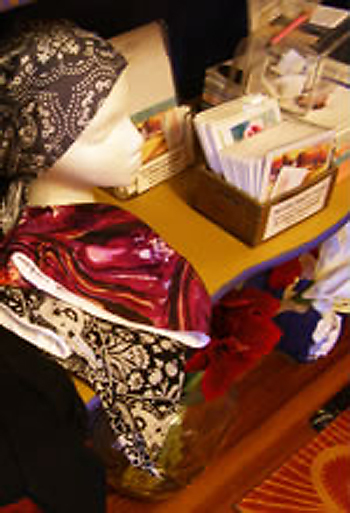 Visage also offers a beautiful selection of hats and scarves in a wide array of styles, colors, fabrics and prints. These hats and scarves were not only designed for fashion but also to serve the needs of anyone dealing with hair loss, including those undergoing cancer treatment or suffering from other medical conditions, or just from thin or thinning hair. These hats and scarves are very comfortable and stylish. They offer maximum coverage and a secure fit and are available in a variety of materials, including all natural fabrics such as pure silk and 100% cotton. Please consult with our stylists to help you choose the style and function that best serves your needs, hairstyle and wardrobe. Ask for an appointment in order to reserve our private room so it is available when you visit us. We can help you decide on the best choices.